The Kincardine Sunset Quilters guild met this morning. In the winter it is always a worry whether or not we will be able to get there. It was my turn to drive and the weather was OK. It was snowing a little and the plows were out but nothing really bad. 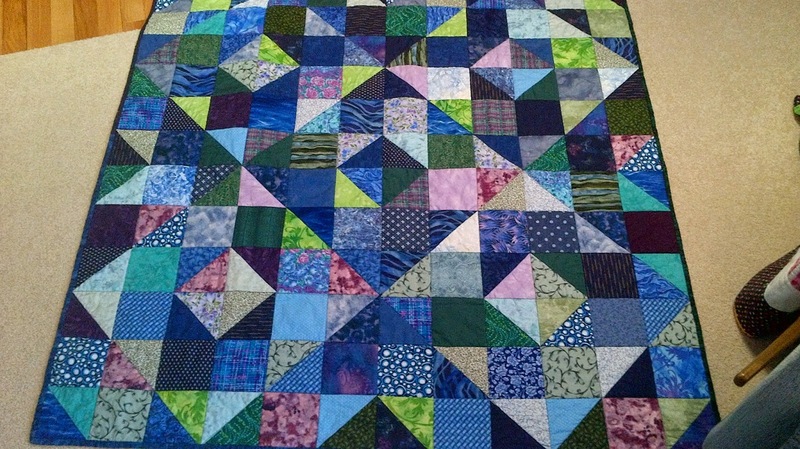 For today, participants were asked to bring their largest quilt or a picture of it. I knew that was not going to be me. I have made about a half dozen queen size quilts but prefer the more manageable sized lap, baby and even up to a double bed size quilt. There were some stunning quilts on display. One member brought a Cathedral window quilt all done by hand while she and her hubby traveled. We broke into small groups to talk about the largest quilt we had made and tips and tricks for doing that. It was very informative. Last fall we were supposed to bring our smallest quilt but that had to be postponed so maybe next year. This one was started early last year. It is called Diamonds in the Rough and was done as part of a quilt along hosted by Karrie Lynn at Freckled Whimsy (here). You will need to visit her archives pages to get the directions (look for March and April 2014). I thought the pattern was available on Craftsy but could not find it so she may be one of the many who took down their stores over the European VAT business. Anyway to describe the quilt. 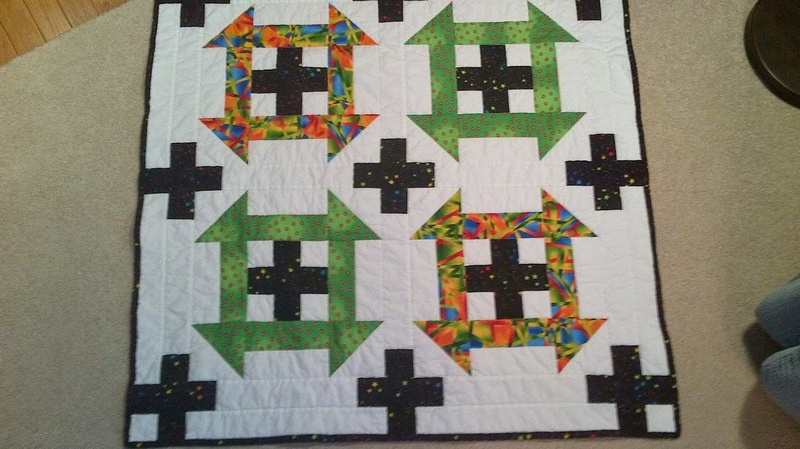 The original was made using 3 1/2" squares and HST's that were 3 1/2". I had a whole bunch of 5" strips so I cut 5" squares to make 4 1/2" HST's and trimmed some other 5" squares to make 4 1/2" squares. I was quite happy with the final result. It is 48" square. We plan to escape the COLD with a brief family vacation in Costa Rica towards the end of next week. The sewing machine I use to do my machine quilting has gone to the spa for restoration so I expect to spend my sewing moments packing or trimming scraps this week. I plan to Link up with Oh Scrap (here) later on Sunday afternoon.